We’ve had to wait two weeks for another Monster Energy Supercross and it sure didn’t disappoint. 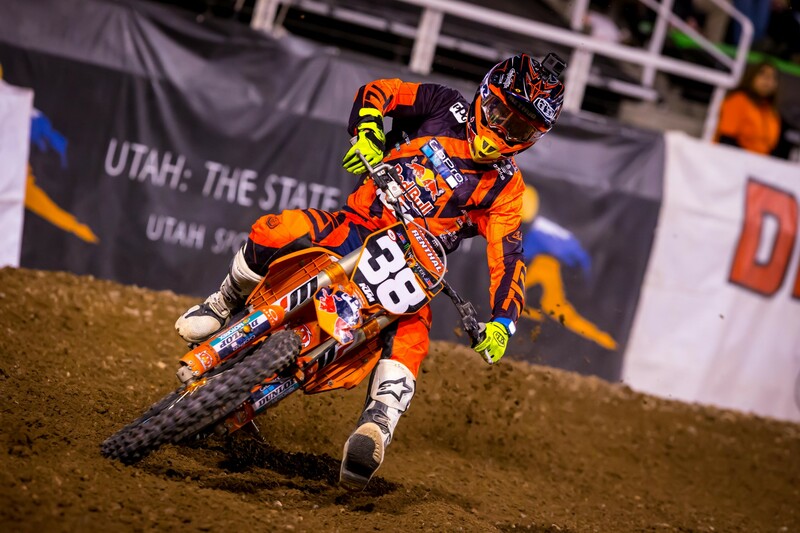 There were two very different championship situations between the 250 and 450 classes coming into Salt Lake City. 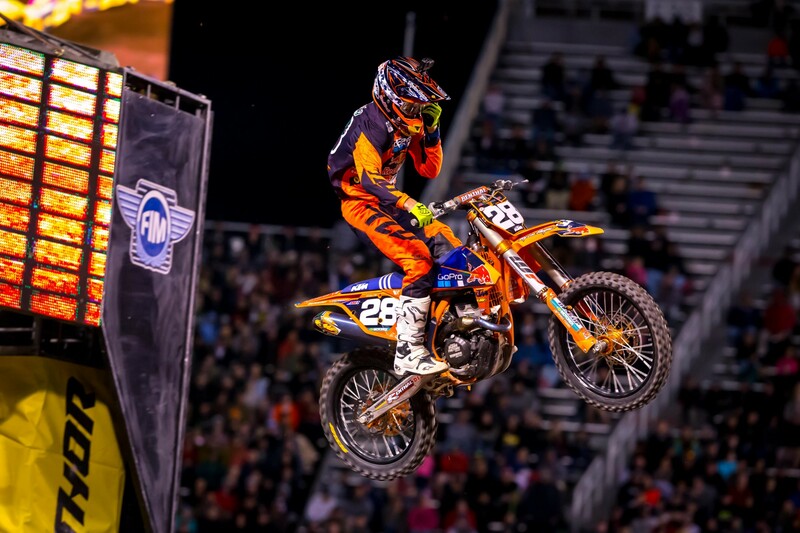 In the 250s, Justin Hill led Aaron Plessinger by 18 points coming into the race and was hoping to clinch the championship. 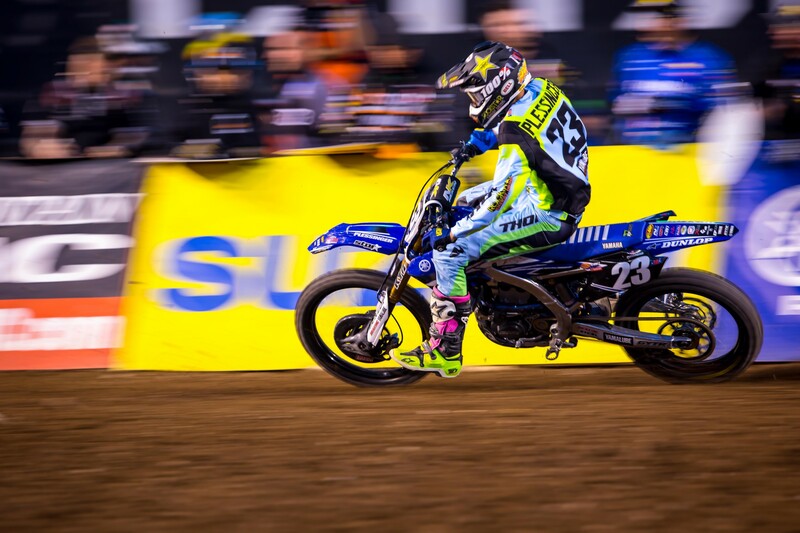 Plessinger needed finish fourth or worse if Hill was to win for that to happen. In the 450s, Eli Tomac and Ryan Dungey came into the race tied in points. There was something in the air tonight in Salt Lake other than the less oxygen due to the elevation. The 250SX main was setup to be some great racing with a lot of big players up front, but it was a bit of a snooze fest at first. After the first couple laps settled in Aaron Plessinger was out front followed by Shane McElrath, Austin Forkner, and Justin Hill. Each of these guys were two to three seconds apart and that’s how it seemed it would end. Plessinger pulled a gap of about 3.6 seconds over McElrath and looked like he was going to take the easy win before disaster struck. He got a little sideways in the whoops and then hung off the back of the bike as he tried wheeling through. After Plessinger dropped the nose at the end of the whoops it was a full eject over the bars. He did a half front flip and landed straight to his back after the final whoop. It was a violent crash and he would not continue the race. I saw an image sequence of the crash and he hit so hard coming out of the cockpit that he broke the front brake lever off the handlebars before the bike even hit the ground. Oldenburg got his first career podium in Seattle and it must have given him a massive confidence boast because he was one of the fastest guys all day. He was fourth overall in practice, second in his heat, and second in the main. He came through the pack and made a pass on the points leader for a 1-2 finish for TLD/Red Bull /KTM. The 450SX main event was set up perfectly before the gate dropped. Red Bull KTM’s Ryan Dungey had won his heat over rival Monster Energy Kawasaki’s Eli Tomac and both riders could take a bit of victory from it. Dungey can say he held off Tomac for the actual victory and Tomac can say that he caught Dungey from a ways back and that’s with a lapper holding him up for a bit. When the gate dropped for the record long 27 lapper, it was RCH Suzuki’s Justin Bogle and Rockstar Husqvarna’s Jason Anderson flying into the turn 1-2 with Dungey right there. 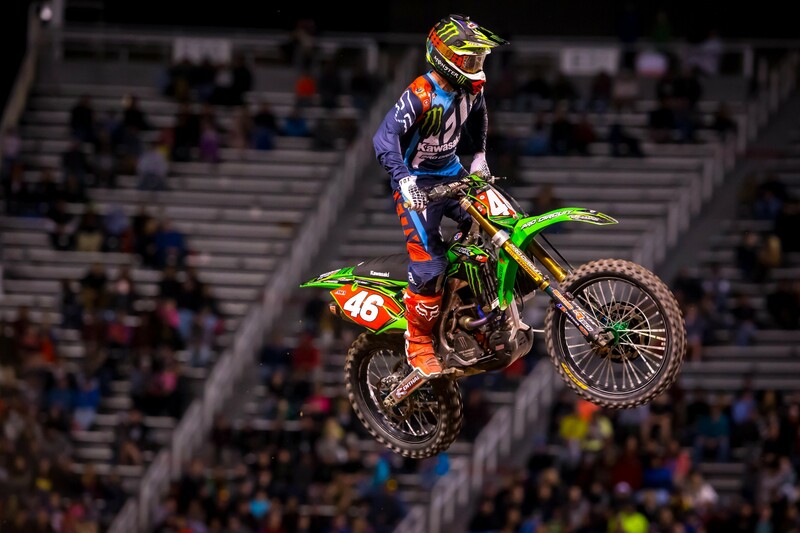 Tomac had gotten a terrible start (he made mention in the press conference that a rider next to him flinched and he went, then had to pull back) as did Dungey’s teammate Marvin Musquin. Both riders, tied for the lead in the class and third in points, were buried and closer to last than first. Meanwhile up front before the end of lap one it was Dungey getting Anderson with a slick pass and he immediately started pulling away. The race looked over at this point with Dungey getting his third win of the year. Tomac meanwhile got busy picking off riders using his superior whoop speed and seemingly his skill of being able to put the bike anywhere he wanted. Before he really got going though, Musquin made an aggressive move on Eli and passed him at one point. Tomac soon got back by the KTM rider and chased down a possible podium spot. Or maybe more? Setting times two seconds faster a lap than many riders around him, Tomac made short work of his teammate Josh Grant (who rode well tonight with a heat race win and a fifth in the main) and then Anderson. Soon he was in second and closing on Dungey. The impossible seemed possible. Cutting inside of Dungey at one point looked to have the deal sealed until a screw up in the next turn allowed Dungey to get back by. The crowd was going nuts at this point and everyone knew the pass was going to come in the whoops. Dungey admitted that he knew his whoop speed wasn’t enough to hold off the #3 and to his credit he changed his line and picked up his MPH there but it was too little, too late. The lap after Dungey got back into the lead the green train went by in the whoops, made the pass in the left hand turn after and that was it. An amazing ride by Tomac that had everyone’s mouths gaping. The race was over, Tomac poured it on to pull away from Dungey by six seconds. Anderson was third and Musquin, in a ride that was almost as good as Tomac’s but won’t be talked about, got Grant on the last lap to take fourth. "I was stuck in a tough position [off the start] and I had to make it happen. 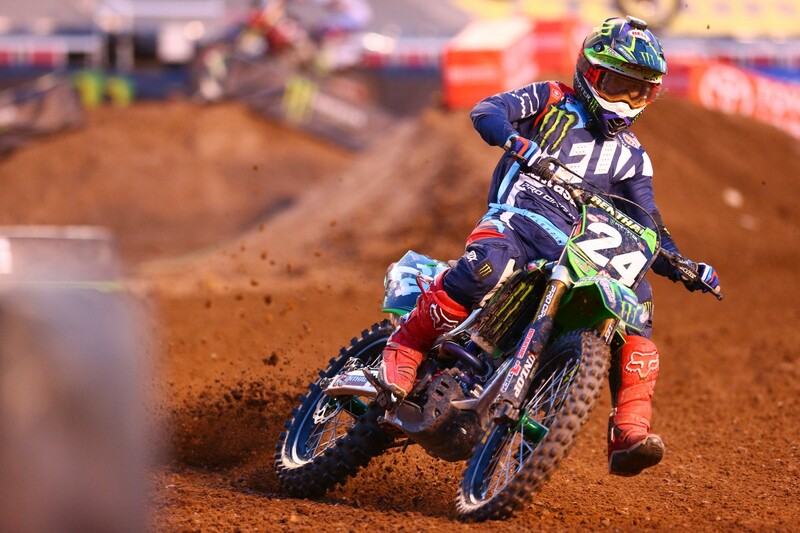 It was all I could do," said Tomac. "We were feeling awesome all day and really had a few good spots on the track where I was able to make a lot of passes. The start wasn't ideal at all. I had a flinch on the gate, so that was something else for us [to deal with], [but] I felt great the whole time. This was pretty cool to come back and do that." "It's good to get points, but we've got to win. Eli [Tomac] was riding good tonight. 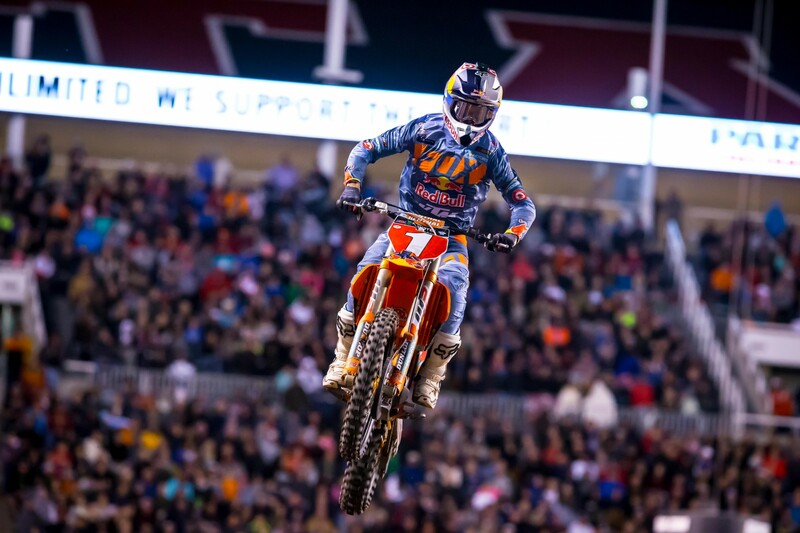 He caught us, passed us, and that's what it was,” said Dungey. “There were a lot of positives tonight, but man, I was hoping to get out front and just take it all the way, but it doesn't happen like that all the time. It's a bummer, but we put ourselves out there and came up a little short. I'm really happy with a lot of things, but instead of second place I wish we were one step higher." So there’s a new points leader next week in New York and after what we’ve been seeing the last couple of months and here tonight in Salt Lake City, there’s no doubt that Tomac is just on another level right now.